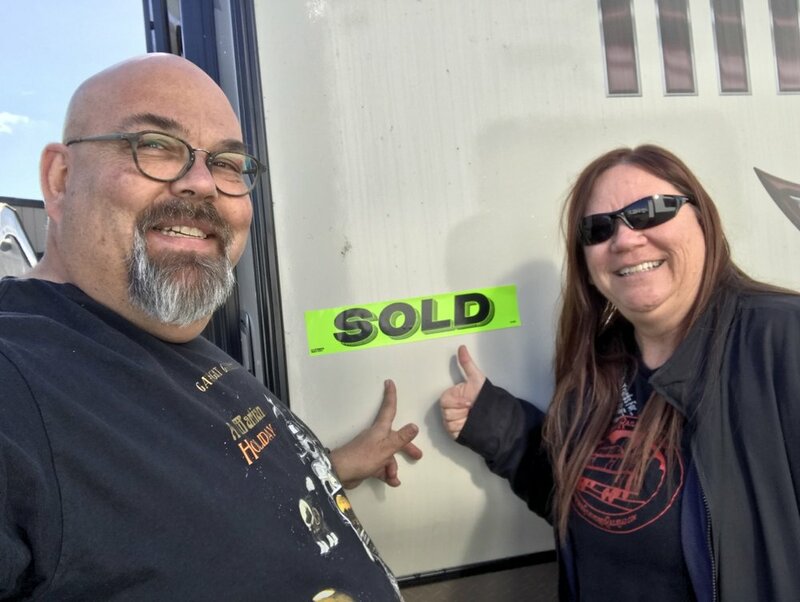 Balancing work and vacation is a challenge for most of us but one couple, Scott and Roxanne Blinn, touring the country in a Georgie Boy Landau motorhome means they’ve got the balance in check. I recently had the chance to talk with them about their experience as mobile musicians and the two have definitely got things figured out. Since last August the pair has been criss crossing the US performing for audiences, many of whom are regular fans strewn about the US and even Europe. “We got sick and tired of staying in crappy hotels, dealing with check-ins, only having so much time to get ready before sound check. A lot of time the hotels can be just gross,” said Scott. While the couple has a home base in Southern California, I ran into them hundreds of miles north where they were performing with Billy Watson in a lively rockabilly style show where Billy’s vocals and harmonica antics were a huge hit with audiences over a three day period. This means that if they want to wake up with the sound of the ocean in the background, it’s done. If it’s under the pine trees with the birds singing, done. Best of all their performances across the US mean that Lloyd Christmas, their dachshund, gets to be a traveling companion and part of the adventure. But waking up in cool spots is just another great part of the RV adventure. From a work standpoint it makes sense as well. For example, if they book a performance often times the venue will mark off a spot for them so they can roll up to the venue well in advance, set up their gear and just relax. Instead of rushing to the show after the hotel finally lets them check in, they can show up when it’s convenient for them, set up the sound system and sit back for a while in advance. Talk about StressLess Camping! Or is that StressLess Working? “Man, it just makes sense for us,” enthused Scott. Furthermore if inspiration finds them out there on the open road they can pull over and lay down a track for one of the cuts on their upcoming album with Ripcat Records. Today’s gear lets them have enough equipment on board to have the RV be a mobile studio as well as a home and a dressing room and a great vehicle for finding adventure. Yep, that pun was intended alright! The motorhome itself was quite a find. The Blinns are the third owners and they had been scouring the adverts looking for a used motorhome for some time. In August of 2017 they were about to leave Reno, NV when this popped up in their search. While it was still in the hands of the second owner, that owner had done some modifications that Scott describes as “not to everybody’s taste” so he knew they’d have a tough time selling it. However, for Scott and Roxie it was the perfect thing and they were able to get it for just the right price. Fortunately Roxanne had done her homework and, while they’ve never done a day of RVing before buying the motorhome, they felt very well qualified to adapt to this lifestyle immediately. Now, ten months later, it’s been great. They had been planning such a move and had already done a great deal of decluttering. It turns out that everything they needed fit right into the motorhome perfectly. Of course it had to be named Cousin Eddie. Another advantage they’ve realized is that they can travel to places where other musicians are so collaboration on music is a breeze. If they have someone in a distant state who only has certain hours that they can work, that’s no problem. Cousin Eddie’s parked in front and the band’s jamming. Or, perhaps, they’re laying down tracks inside the RV while passers by are just passing by, having no idea of the hot jams happening that are being cooked up in the kitchen. Of course traveling the 20,000 miles they’ve traveled in Cousin Eddie means there have been the occasionally hiccups. For example, going over a two-lane road in the mountains of Colorado Roxanne heard a loud snap followed by the motorhome having zero power. While it could have been anything, it turns out that it was just the cable coming off the back of the accelerator pedal so a few minutes of nail biting as trucks rolled by along with a bit of Gorilla tape and the rig was back on the road. If you would like to enjoy some great tunes and meet a couple who have clearly figured things out you can follow them on their website. Think of that as a jumping off point to all the places where you can get your toes tapping and fingers snapping. And if making work work so you can wake up where you want to isn’t StressLess Camping, then I don’t know what is. You can follow Scottie and Roxie's journeys on their website - Black Market III. Additionally, they have recently been signed by Rip Cat Records and are collaborating on a new album, with doing so being much easier thanks to working out of the motorhome.